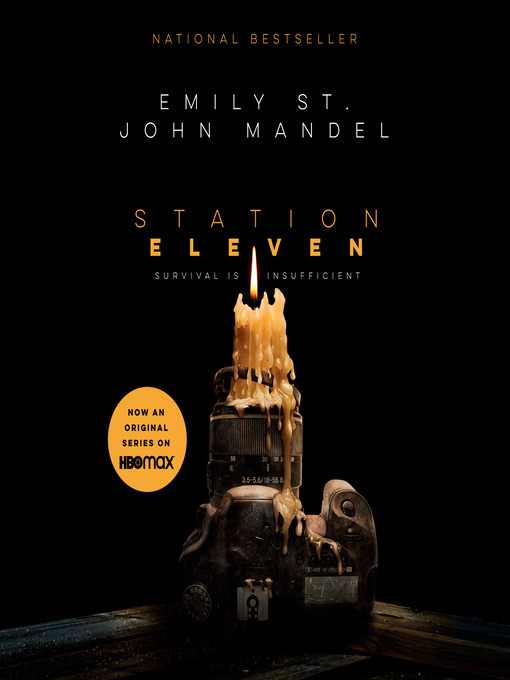 Station eleven [electronic resource] : a novel / Emily St. John Mandel. [S.I.] : Penguin Random House Audio Publishing Group, 2014. 2014 National Book Award Finalist A New York Times Bestseller An audacious, darkly glittering novel set in the eerie days of civilization's collapse, Station Eleven tells the spellbinding story of a Hollywood star, his would-be savior, and a nomadic group of actors roaming the scattered outposts of the Great Lakes region, risking everything for art and humanity. One snowy night Arthur Leander, a famous actor, has a heart attack onstage during a production of King Lear . Jeevan Chaudhary, a paparazzo-turned-EMT, is in the audience and leaps to his aid. A child actress named Kirsten Raymonde watches in horror as Jeevan performs CPR, pumping Arthur's chest as the curtain drops, but Arthur is dead. That same night, as Jeevan walks home from the theater, a terrible flu begins to spread. Hospitals are flooded and Jeevan and his brother barricade themselves inside an apartment, watching out the window as cars clog the highways, gunshots ring out, and life disintegrates around them. Fifteen years later, Kirsten is an actress with the Traveling Symphony. Together, this small troupe moves between the settlements of an altered world, performing Shakespeare and music for scattered communities of survivors. Written on their caravan, and tattooed on Kirsten's arm is a line from Star Trek: "Because survival is insufficient." But when they arrive in St. Deborah by the Water, they encounter a violent prophet who digs graves for anyone who dares to leave. Spanning decades, moving back and forth in time, and vividly depicting life before and after the pandemic, this suspenseful, elegiac novel is rife with beauty. As Arthur falls in and out of love, as Jeevan watches the newscasters say their final good-byes, and as Kirsten finds herself caught in the crosshairs of the prophet, we see the strange twists of fate that connect them all. A novel of art, memory, and ambition, Station Eleven tells a story about the relationships that sustain us, the ephemeral nature of fame, and the beauty of the world as we know it. From the Hardcover edition.